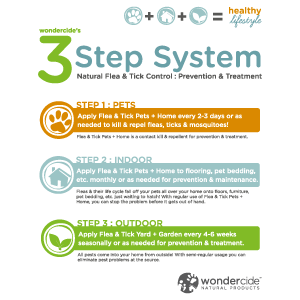 Wondercide has revolutionized toxic pest control with our 3-Step Natural Pest Control System. Following these 3 simple steps, you can safely and effectively treat and repel pests from inside & around your home – all without the use of conventional pesticides. 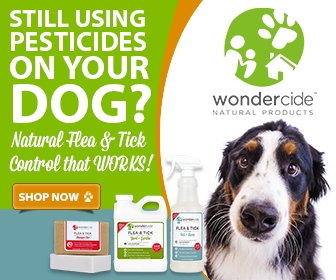 Wondercide offers an all natural flea & tick treatment for pets called Flea & Tick Pets + Home that is 100% effective killing the life-cycle of fleas & ticks. Start by applying Flea & Tick Pets + Home to your dogs & cats to ensure you kill any fleas and/or ticks they may currently have. At the same time, you will be creating a barrier around your pets because unlike conventional pesticides — Flea & Tick Pets + Home actually repels too! Use every few days or as needed when going on walks, to the park, etc. Once you’ve treated your pets, it’s time to shift your focus to the inside of your home. Remember that you and your pets are constantly going from outside to inside. And in this process fleas, ticks, and other insects fall off you and your pets onto floors, furniture, pet bedding etc. So, you’re going to need something natural that’s safe to use all over your home. Flea & Tick Pets + Home is safe, effective and non-staining, so you can use it all over without worrying about toxins, harsh chemical smells, or other potential health issues. Flea & Tick Pets + Home is made from food grade ingredients, so it’s safe to use on all flooring, bedding, and fabrics. Plus, there is no wait time to re-enter your home – because you’re not using toxins. And since it’s so safe and effective – you can use Flea & Tick Pets + Home quarterly, or as needed for prevention and maintenance. All pests come into your home from outside! With semi-regular treatments, you can eliminate pest problems at the source. 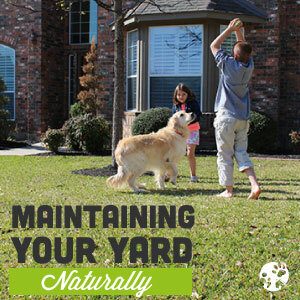 Just like Flea & Tick Pets + Home naturally treats the inside of your home, Wondercide’s Flea & Tick Yard + Garden was designed to naturally control outdoor pests like fleas, ticks, mosquitoes, ants, and more in your lawn. Flea & Tick Yard + Garden is effective and safe to use – even when your pets and kids are playing in the yard while it’s being sprayed. Simply apply Flea & Tick Yard + Garden every 4-6 weeks, or as needed to prevent and treat bug issues in your lawn – naturally. It’s good to see a pest treatment that is natural and eliminates the risk of harming myself or any pets just to get rid of bugs. As long as a natural treatment is effective enough, there shouldn’t be any reason to use toxic pesticides and put more than the pests at risk. Thanks for sharing. Thanks for your PAWSitive feedback, John! These are great steps to take care of pest without harming the environment! Great article! Great blog post. Too often the go to is harmful chemical solutions, either because they are quick and easy to access or cheaper. However, they also create more lasting negative impacts so it’s good to see someone writing well about just how good and effective natural solutions are. Great article. Well done.